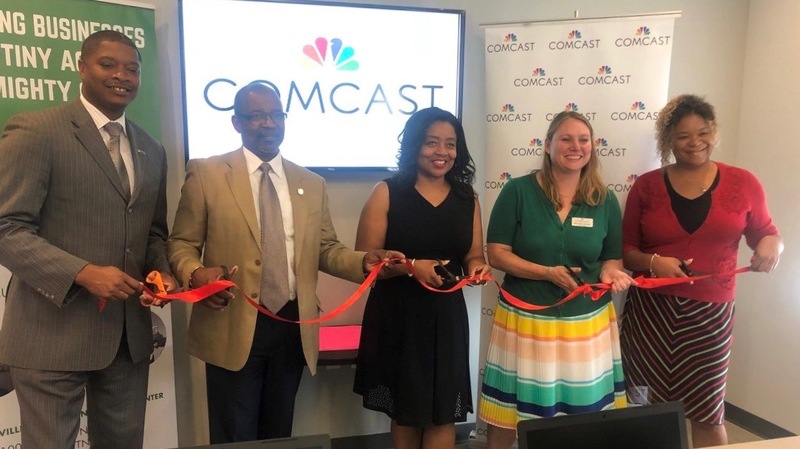 NASHVILLE, Tenn. (July 31, 2018) – Today, alongside community partners and elected officials, Comcast, in partnership with the Urban League of Middle Tennessee, unveiled a new technology lab for at the Nashville Business Incubation Center. The computer lab will be available to NBIC members, community youth and adults. Digital literacy classes will be held in the lab to support the NBIC’s entrepreneurial incubator programs. This is the fourth computer lab that Comcast and ULMTN have opened through a grant partnership with the Comcast Foundation and the Comcast Internet Essentials program. Comcast will also announce a $30,000 grant for continued support of the ULMTN’s digital literacy programs in Middle Tennessee, including the opening of additional computer labs in 2018. Internet Essentials, now in its eighth year, is Comcast’s signature community investment program and the nation’s largest and most successful broadband adoption initiative for low-income families. Internet Essentials’ integrated approach is part of the program’s core design to address each of the three major barriers to broadband adoption – digital literacy, access to computer equipment, and low-cost internet service. The program is also structured as a partnership between Comcast and thousands of school districts, libraries, elected officials, and nonprofit community partners, to address this complex set of broadband adoption issues.